Cities throughout the Kurdistan province of Iran have been on an all out general strike, commemorating the 19th anniversary of the assassination of Dr. Qassemlou, the leader of the Kurdish Democratic Party of Iran. 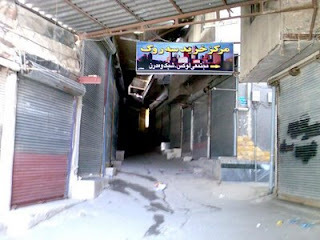 All shops and businesses in Saqiz, Mahabad, Oshnavieh, Bukan, Naghadeh and parts of Oroumieh are all closed down despite severe threats by the Islamic Republic authorities warning businesses that they will lose their permits should they not be open today. Kurdish Democratic Party of Iran, has also asked people to switch their lights off at 10:00 pm local time, in a further act of solidarity and civil disobedience against the Islamic Republic. Dr. Qassemlou's Czech born wife, Helen Krulich, speaking in fluent Persian, appeared on Tishk TV and also endorsed the general strike and the planned lights out later this evening. iranpressnews.com has pictures of this general strike. I just watched VOA News Farsi. There was no mention of this strike. There was a report on US Basketball teams, Traffic jams in the sky and more such trivial stuff!